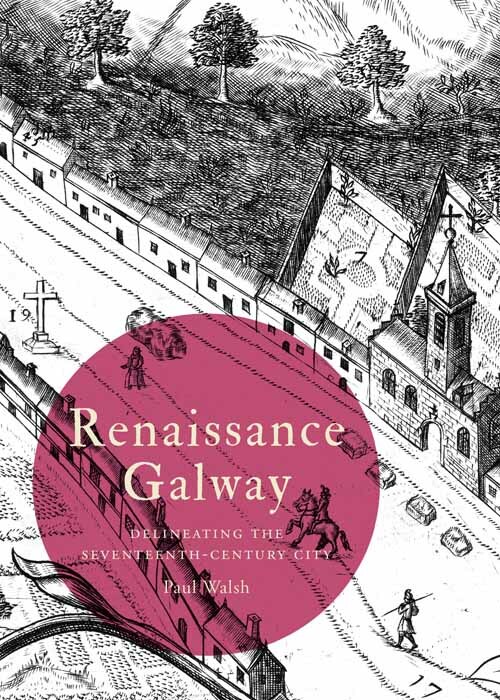 Renaissance Galway is the next ancillary publication from the Irish Historic Towns Atlas. The subject of the book is the remarkable ‘pictorial map’ of Galway, which was produced in the mid-seventeenth century. It offers a bird’s eye view of Galway city at this time and presents insights into the cultural, sociopolitical and religious outlook of the local ruling elite — the so-called ‘tribes’ of Galway. Originally intended as a wall hanging, it was produced to impress and remains a centrepiece of Galway’s visual history. Only two copies of the original printed map are known to exist and it is the well-preserved version from Trinity College, Dublin that is reproduced in Renaissance Galway. Following the format of previous map-guides from the Irish Historic Towns Atlas, the book presents carefully selected extracts from the pictorial map, each accompanied by a commentary. These range from descriptions of particular buildings or areas, to aspects of everyday life that are revealed in the map. In an introductory essay, the author ponders the many mysteries that continue to surround the pictorial map of Galway — its origins, compilers and purpose. Together the map extracts and accompanying texts offer a new perspective — a window into the culture and mindset of Galway’s mid-seventeenth century ruling Catholic elite. The modern viewer is invited to inhabit the world of ‘Renaissance Galway’. Paul Walsh has spent his career working in Irish archaeology and has a passionate interest in the history and archaeology of his native city, Galway. His publications include Discover Galway (2001) and he is joint author with Jacinta Prunty of Galway c. 1200 to c. 1900: from medieval borough to modern city (2015) and Irish Historic Towns Atlas, no. 28, Galway/Gaillimh (2016).